The AWEX EMI closed on 1944c – up 10c at auction sales in Australia this week. 39,894 bales were offered with 93% cleared to the trade. The weekly result was extremely pleasing from the perspective of this was the 6th consecutive week of EMI price increases. In addition it was the commencement of the Chinese NY holiday, where in the past, exporters have reported orders being almost non-existent. This week the phones were quiet until the sale opening then reports of solid orders began to flow. In USD terms, however, the EMI fell 25c as the AUD reacted immediately to the news from the reserve bank that an interest rate cut was back on the agenda. As in previous weeks, some MPG’s in the southern region fell in price whilst the North and West was able to post rises on all reportable MPG’s. Merino Fleece (Northern Region) saw exporters activity on the Superfine offering which drove up the MPG’s (16.5μ to 18μ) by 40 to 45c. The fine/medium MPG’s (18.5μ – 21μ) posted solid rises of 10 to 20c. Merino Skirtings also experienced price increases due to the lack of medium VM (5-10%) which has placed additional price pressure on the 2-5% VM offering. Crossbreds continued their long upward trend posting rises of 10-40c. Apparently the driver for the price increase in this sector is mainly top-makers switching from merino production to the crossbred selection to save up to $10/kg clean in the inventory outlay. Merino Cardings were slightly cheaper in the Eastern selling centres and held firm in the West. 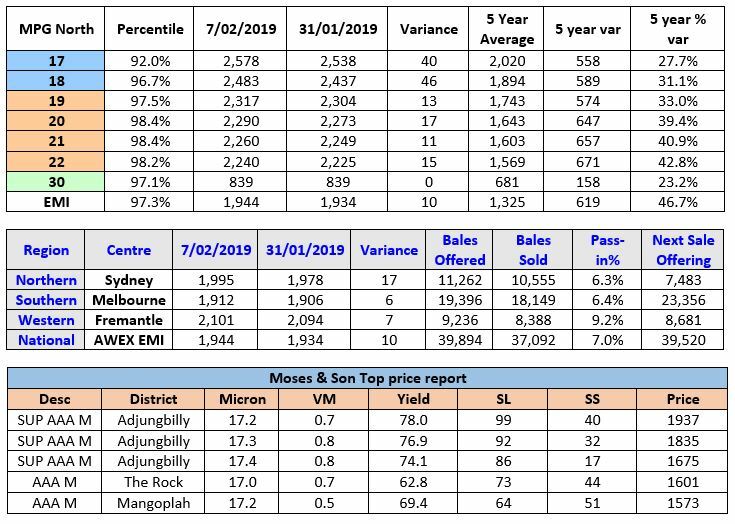 Forward Price Report from Michael Avery (Southern Aurora Wool): The forward market opened a little hesitantly with the back drop of the Chinese New Year expected to lead to a slow in demand. While volumes where moderate levels rose as the week progressed. Autumn levels lifted and established new benchmarks with 19.0 microns trading at 2250 and 21.0 at 2200. There was light trading in the spring but at discount of 150 to 170 to spot. This reflects the high risk that the forward market sees at current levels. The impact of demand destruction is yet to come into play as tight supply is keeping any potential price trend reversal in check. Even at the discount the trading levels in the spring represent a price band in the 85 to 90 percent range for the last four years. Processors seem to be unwilling to price much quantity above the lows of last summer that saw 19.0 at 2100 and 21.0 at 2050. Even at these levels processors are unable to find significant garment orders. Grower hedge volumes remain low with traders making up 40% of the sell side this week. We expect to see interest at similar levels next week with the possibility of better pre-Easter bidding as exporters look to cover some risk. Commentary: It is great to see the superfine selection reignite this week in Sydney, especially when the offerings are becoming more drought affected with more dust and less staple strength. I noticed that $30/kg clean was achieved on a select number of superior style and specified lots in the 16μ and 17μ selection. As the drought extends into February, it was nice to see some storms in the district however, it was gut wrenching to see the damage done to some of our clients in the eastern region who lost fences and infrastructure in a flash flood that delivered 150mm or better in a short time. Life can be cruel. Whilst the challenges of drought are at forefront our focus, delaying the formulation and rejig our plan for the future could result in lost opportunity. The two big questions I would ask readers are: How much do you think it will cost to buy classed in ewes in the spring? And assuming we get a spring, who will be selling ewes or any stock at that time?